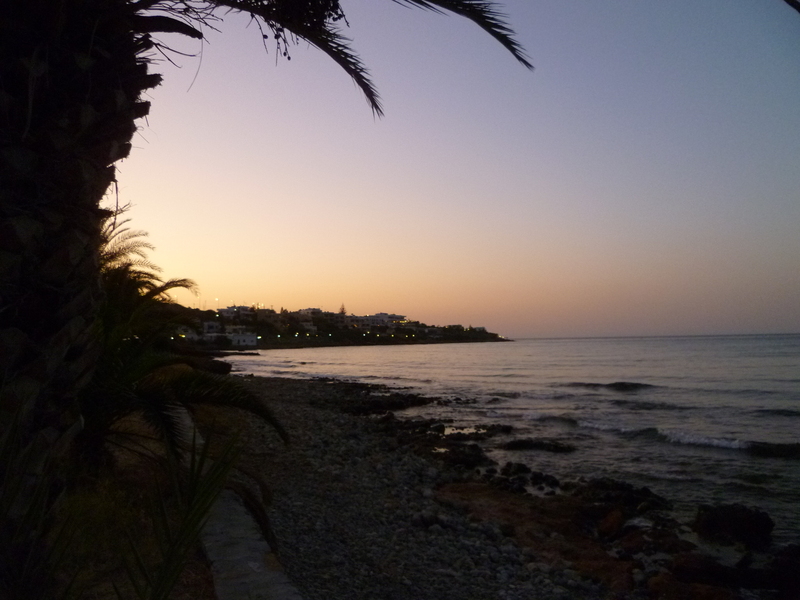 I’ve just got back from a wonderfully relaxing week in Crete. Upon landing, I pretty much immediately missed the place; I missed the idyllic views, the crystal blue sea, and the glorious sunshine. But most of all, I missed the food. Oh, the food. Mouthwatering salads with creamy, zingy, tzatziki. Sweetly spiced moussaka that seemed to be topped with clouds. Halloumi grilled to perfection and served with a drizzle of olive oil that tasted like it was squeezed between the thighs of Greek goddesses. What I particularly love about Greek food is its simplicity; the focus on beautifully fresh ingredients, complimented by a handful of herbs and (usually) a good squeeze of lemon. After a traumatizing flight that landed at 6.30am, I decided needed a feta fix. I headed off to the supermarket and happened to pick up some reduced lamb steaks, some feta, and two large pots of Greek yogurt. I popped to the grocers and got more fruit and vegetables than you can shake a stick at. And I went about creating my big fat Greek feast. Since Greek food is so simple, there’s no real need for a recipe – just use your eyes and your nose (and a lick of the finger, when no one’s watching). But if you’d like a bit of inspiration, here’s my take on how to transport yourself to Hellenic heaven. Makes 4 generous kebabs to serve 2 people. half of one fresh or pinch of dried chilli flakes – if you like it hot! drizzle with olive oil. Season generously. Finely chop garlic, and add to the meat along with the herbs and chilli – I added thisjust to the chicken ’cause we’re a chilli fanatic household. Leave to marinate for as long as you can hold off – ideally 3-4 hours or – even better – overnight. Peel and finely grate your cucumber. Wrap in a muslin cloth to drain off the water, or press down hard on it in the bottom of a bowl. Season with sea salt and black pepper to help remove excess water and avoid watery tzatziki. Leave it for a few minutes, before adding to the yogurt. Throw in your olive oil, lemon juice, garlic, dill, and mix. Sprinkle over your paprika, et voila! 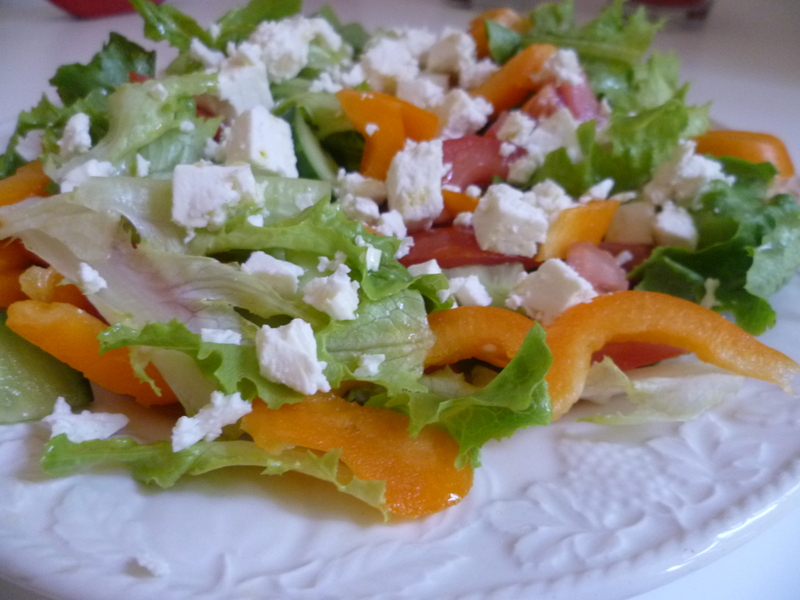 And don’t forget your beautful, fresh Greek salad – toss together fresh tomatoes, cucumber, thinly-sliced peppers, lettuce if you fancy it. Drizzle with extra-virgin olive oil, crumble over some feta cheese and squeeze over a tablespoon or two of lemon juice. Who knew a simple salad could taste so good? 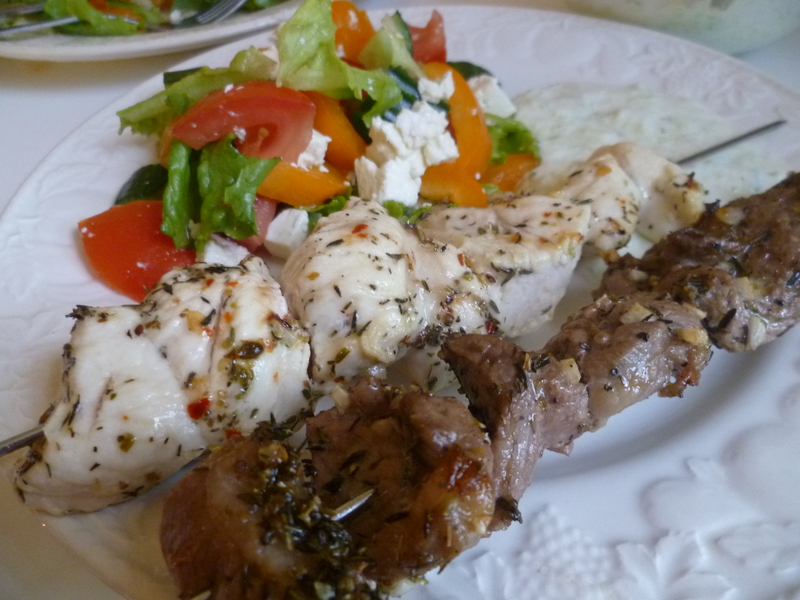 And there you have it; an easy, delicious Greek feast, fit for the gods. I can’t promise that it’ll come with a spectacular view, or even a glimmer of sunshine, but it’s almost certain to make you feel sunshiney inside. Yiamas! I really think I could eat tzatziki with just about everything! It’s so refreshing (and low fat, too). I’m sure you’ll make it to Europe one day 🙂 we’re very lucky having so many wonderful places to visit on our doorstep – but I know Canada is b-e-a-utiful, so you’re a lucky lady too!